Seven months after her daughter was brutally murdered on a rarely used road outside Ebbing, Missouri, Mildred (Frances McDormand) is frustrated that the local police department is not doing anything to solve the case. 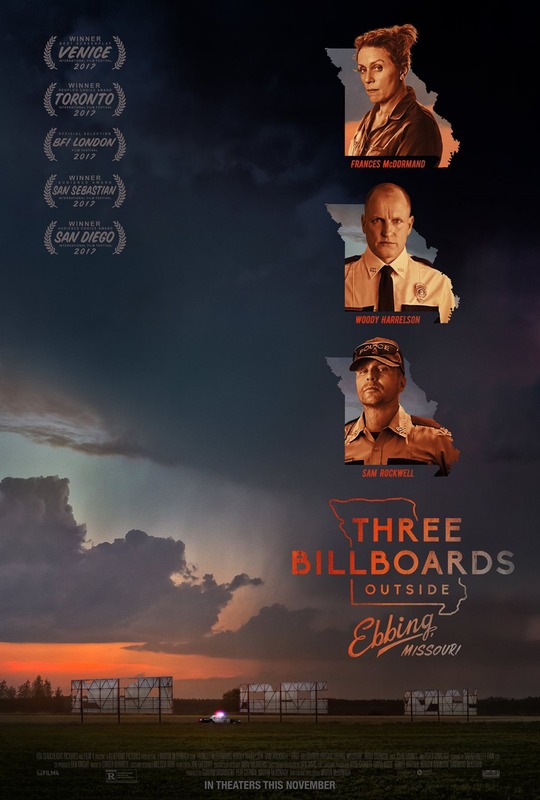 To coax them into action, she rents three billboards on the same road with a message calling out Chief Willoughby (Woody Harrelson). The residents of Ebbing don’t receive Mildred’s billboards well. Not only are they graphic in description, but it is known that Willoughby is suffering from cancer. The police force is also understandably upset about the billboards. Jason Dixon (Sam Rockwell), an openly racist member of the force who has been rumored to torture suspects, has taken particular offense. Dixon goes so far as to threaten and assault Red (Caleb Landry Jones) for not revealing who he rented the billboards to. As pressure mounts on Mildred to take down the billboards, she responds in kind. Taking on the townspeople, the police force, and her abusive ex-husband, Mildred will stop at nothing to bring her daughter’s killer to justice. It really is no surprise Frances McDormand is up for a Best Actress Oscar for this role. She gives an amazing performance. Her grit and determination show as a mother desperate for justice in her daughter’s brutal murder. On top of that, her jabs with Woody Harrelson and Sam Rockwell are well delivered and add just enough levity to the story to keep it from getting bogged down by the seriousness of the story. Harrelson is more of a minor player in the story. That isn’t to say he isn’t necessary to the story. It is his character’s arc, after all, that helps pit Mildred against the townspeople. Her main foil is Sam Rockwell. Rockwell’s character is a known bigot. He isn’t afraid to cross the line into grey territory, even going so far as to break several laws, to protect the department. Rockwell lends his charm to the role, keeping him just on this side of being completely hated despite his character’s horrible personality. The Best Original Screenplay nomination is well-earned. Martin McDonagh toes the line between a serious, all too real story and giving us an entertaining movie. This type of story likely happens more than most realize and is supposed to make you uncomfortable, which it does. The extent to which the police department goes to protect themselves is also believable. They don’t want to be questioned on their tactics and will go to great lengths to put an end to it. Rockwell’s racism becomes somewhat of a punchline, but doesn’t go so far as to excuse it. Nominated for 7 awards, Three Billboards is deserving of every one. It is a compelling, well-told story served by its excellent cast. So far, it is one of my favorites for Best Picture. Don’t pass this one up.